Eco-friendly, sustainable, and environmentally friendly gardening promotes a healthy lifestyle, decreases negative environmental effects on the planet, and reduces your environmental footprint. 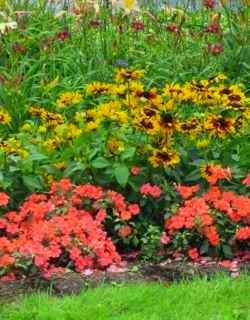 Design a garden that fits your environment, climate, and location by planting plants that are native to your region. Native plants will need less maintenance and will look beautiful at the same time. Grow your own vegetables from seeds. Growing your own vegetables will provide you with great exercise, better tasting vegetables, save you money, and reduce fossil fuel emissions caused by food transportation. Select environmentally friendly methods to improve your garden soil and to control pests and weeds such as using baking soda and potassium bicarbonate. Plant trees in your garden. Trees are a habitat for wildlife, provide shade, protect your home from the wind, and improve air quality. Throw your used coffee grounds into your compost or drop them right on top of your soil. 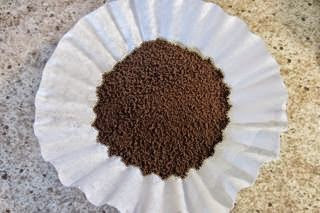 Coffee grounds are rich in nitrogen and can improve plant growth. 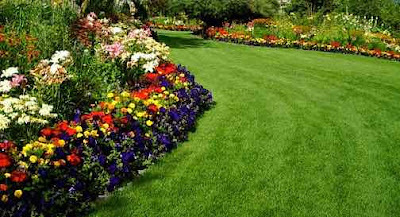 Use eco-friendly fertilizers and pesticides for your flowers and vegetables. Use natural products to control insects such as milky spore bacteria to control Japanese beetles. Eliminate weeds with organic non-toxic herbicides. Try corn gluten as a natural choice for managing weeds before they grow. Use salted water or a mixture of water and white vinegar to remove weeds from your garden. Both are environmentally and pet friendly. Grow plants with low water needs. Perennials such as trilliums need less water than annual bedding plants. Try companion planting in your eco-friendly garden. Companion planting is the close planting of different plant types that enhance each other's growth, protect each other from pests, and reduce plant disease. Grow onions or chives with carrots to keep carrot root flies away. The scent of the onions or chive will make the carrots harder to find. Grow basil plants next to your tomatoes to improve their growth and flavour. Mint, rosemary, and lavender will keep ants and mosquitoes away. Plant camomile, cosmos, and marigold plants to attract beneficial pollinating insects. Tansy and dill plants will keep away aphids and spider mites. 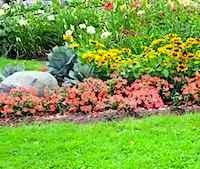 Grow garlic next to lettuce and marigold flowers beside corn. Plant summer savoury next to green beans and oregano besides cucumber plants. Plant chives next to roses to repel pests that eat roses. Plant herbs with a strong scent to discourage insects from coming into your garden. Spearmint and sage will keep ants away. Fennel, basil, and mint help control mosquitoes and flies. Use lemongrass plants in pots on your deck or patio to help repel mosquitoes. Growing citronella grass around your outdoor seating area will also help to keep mosquitoes away. Collect and use seasonal rainfall to water your garden by using water collection barrels. Use organic compost or mulch instead of chemical fertilizers in your garden. Create a compost bin so that organic waste can be reused as natural fertilizer for your lawn and garden. Make your own nutrient filled compost from a mixture of grass clippings, vegetable peelings, paper, and garden trimmings. Use egg shells as a natural fertilizer in your garden. 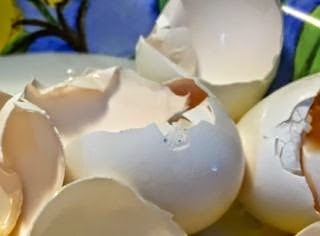 Egg shells are rich in calcium carbonate. Crush them up with your hand or blender before tossing them in your garden to enhance the soil. Grow perennial flowers such as blue salvia nemorosa and yellow coreopsis to attract pollinating insects such as bees and butterflies to your environmentally friendly garden. Water your planted garden seeds with cool chamomile tea a couple times a week. Chamomile will maintain your plants health and will reduce bacterial and fungal infections. Use mesh netting and fleece to prevent pollinating insects from laying their eggs on your vegetable plants. Use boiled water from cooking in your kitchen to water your garden plants. Boiled water from cooking contains lots of vitamins and minerals that will nourish your garden. Use bone meal, cottonseed meal, and seaweed meal as a mixture with your compost to improve your garden soil. Decrease your lawn space by replacing grass with low-maintenance plants. This will save water, energy, and your time. Consider installing a water saving irrigation system. Plant deciduous trees on the west and south side of your property to reduce your home cooling and heating energy usage. Deciduous trees provide shade in the summer to keep your home cool and let the sun through in the winter to keep your home warm. Use solar powered garden lights. Use newspaper and black plastic bags to prevent weeds from growing back in your front yard and your backyard. Reuse food packaging such as yogurt and ice cream plastic containers as pots for plants; to save money and to reduce waste. 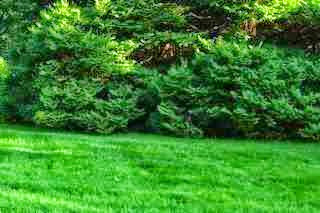 Pick eco-friendly gardening tools if possible such as a push lawn mower. Using eco-friendly gardening products in your garden will show respect for the environment and will help maintain a healthy planet for future generations. 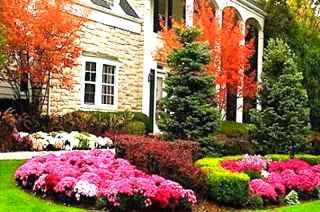 Following the tips in this article will make your garden beautiful and environmentally friendly at the same time.